The lowdown: Although Adderley was a triple threat as a prep player – receiver, returner and defensive back – his recruiting interest was limited mostly to FCS schools and one FBS program (Wake Forest). The Blue Hens quickly realized they might have something special on their hands when Adderley started all 11 games as a true freshman, leading the team with eight passes defended. He played both cornerback and safety at Delaware and elevated his profile to first-team all-conference and second-team all-FCS by his senior season, intercepting nine passes over his final two years combined. That caliber of ball skills rightfully will earn serious NFL attention, even if it’s at a lower level of college football. As a center-field safety more often than not late in his college career, Adderley demonstrated a great nose for the ball and the ability to do damage with the ball in his hands. He had 135 return yards and a touchdown on his five interceptions in 2017 (although only 1 yard on four picks last season) and a 92-yard kick return for a score in 2018. 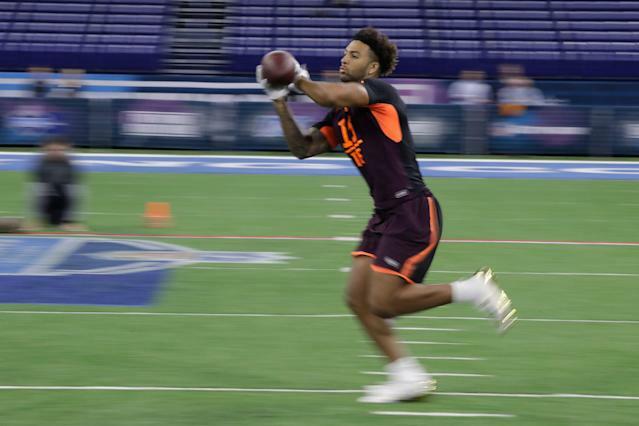 From a height-weight-speed perspective, Adderley doesn’t read as your typical first-round safety. He plays the game with an edge, willing to assist in the run game and eager to send a message to receivers who venture on his turf. His background as a cornerback won’t hurt him, either, and there are some NFL teams that might project him into that role. Adderley’s college tape isn’t always pretty. Sophisticated offenses such as North Dakota State manipulated him with the option run game, play-action and screens, using his aggressiveness and occasionally unsure eyes to work against him. There are NFL traits to work with Adderley, but he’s a player in need of seasoning. With the right patience and development, he could end up being a tricky fit early on. Fun fact: Nasir Adderley is cousin to Herb Adderley, the former All-Pro cornerback with the Green Bay Packers and Dallas Cowboys who won three Super Bowls and was inducted into the Pro Football Hall of Fame in 1980. At the Senior Bowl, Nasir said they still talk fairly often. The lowdown: Risner stepped in as the team’s starting center in 2015, kicking off a career reminiscent of former Wildcats offensive lineman Cody Whitehair (second-round pick of the Chicago Bears in 2016). Risner moved to right tackle as a sophomore and earned first-team all-Big 12 mention. He stayed at right tackle the remainder of his college career but likely projects to be an interior blocker in the NFL. Risner didn’t allow a sack since Week 5 of the 2016 season against West Virginia – a completely clean sheet for his final 33 college games. Risner was forced to miss the Wildcats’ bowl game his junior season and had offseason surgery to correct his left shoulder. It didn’t affect his performance on the field, again named first-team all-conference, and he was able to build up his strength again, reportedly posting a max squat of 475 pounds, max bench-press 355 and max hang clean 340. At the combine, turned in a slightly disappointing bench number of 23 reps, but his 34-inch arms also played a part in that number. The first thing you notice watching Risner play is his aggression. He’s a salt-and-vinegar blocker who seeks to bury people and play through the whistle, and he’d make an excellent addition to a passive unit that needs more fire in its players. His lack of ideal athleticism makes him a natural projection to being a guard in a gap-blocking scheme, but he isn’t a one-trick pony as he can fit zone systems and play outside if needed. Risner practices at guard and took snaps for the Wildcats as their emergency center. A strong week at the Senior Bowl – where he could be heard barking at defenders after he won battles against them – only vaulted his stock. His intelligence, intangibles and positional awareness have been praised throughout the process, although he tends to play stiff at the waist and could stand to speed things up. But his effectiveness on the field counts for a lot. Risner wins way more battles than he loses. We are higher on Risner than some other folks. His tenacity and demeanor are enough to overcome some overblown concerns about his athletic limitations. His age could be an issue for some teams, however, as he turns 24 in June. Fun fact: Risner has been a huge participant in philanthropic causes in his time in college, working with Special Olympics, meeting with kids fighting cancer and establishing his RiseUp Foundation to help spread inspiration. The lowdown: Harmon didn’t take long to make his presence felt in college, winning the program’s Philip Rivers Award (top freshman on the team) in catching 27 passes for 462 yards (17.1 average) and five TDs. He then became the program’s first receiver to surpass the 1,000-yard mark as a sophomore since 2003 and bettered his receiving totals as a junior. Harmon declared for the 2019 NFL draft and skipped the Gator Bowl to prepare. 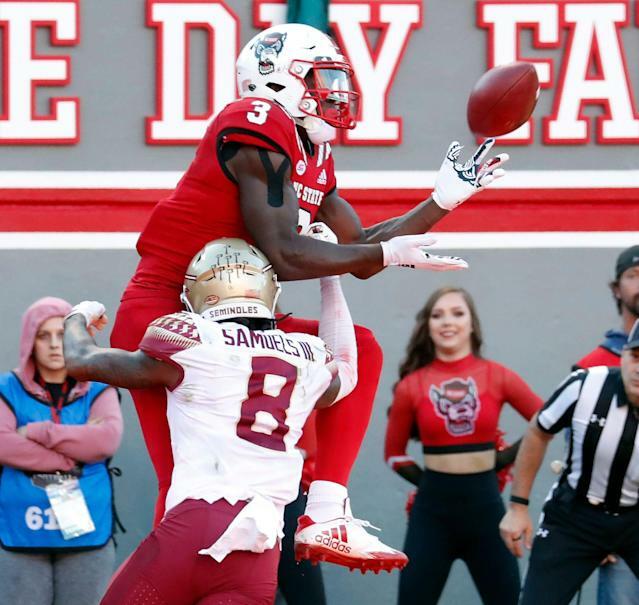 Harmon first burst onto the national scene in 2017 when he put on a show against a talented Clemson secondary, catching eight passes for 155 yards. From a size-speed-strength perspective, he checks most of the boxes. Watch him against press coverage, and it’s clear that he likely invites it from opponents. Harmon also stands out extremely well as a blocker, seeking to bury opponents and open up opportunities for his teammates. He also has enough length to high-point balls over defensive backs and a wide enough catch radius to go outside his frame to snag off-target throws. He uses his good strength, polished routes and quick feet to separate, and his body control allows him to make diving and contested catches, either in traffic or along the sideline. When the ball is in the air, Harmon competes as if it’s his ball – and no one else’s – to come down with. Lacking true vertical burst might always limit him in the NFL, and scouts have commented that Harmon runs a bit knock-kneed, but there’s an alpha-dog element to his game that makes it hard to envision Harmon failing. If he’s nothing better than a solid No. 2 receiver in the NFL, it will be because of his lack of true separation ability. But his swagger and physical brand of ball are almost certain to make him effective in some way, and his peak could be a career similar to Marques Colston. Fun fact: Harmon was born in Liberia, moving to the United States with his family at the age of 4. He had never played football before the age of 13, having seen his friends play it. The lowdown: Abram’s college career got derailed after he transferred from Georgia, citing “personal issues,” following a solid freshman season in 2015. He spent a year at Jones County (Miss.) Junior College in 2016 before signing with Mississippi State as one of the most highly touted junior-college recruits in the country at his position. Immediately becoming a starter, Abram earned first-team all-SEC honors the next two seasons and earned major respect as a team leader. Abram has been described as a “junkyard dog” and fits the mold of run-and-hit safety that once populated the league readily. Physical tone-setters such as Abram are always going to earn reputations quickly for their hitting, and the NFL team that drafts him might have to live with some 15-yard penalties when he’s on the field. He also can play out of control, although most scouts and coaches will tell you they’d rather have that to worry about than a passive player who needs to be cranked up. That will never be an issue for Abram. He takes his craft extremely seriously, plays with a coach’s mentality and will walk into an NFL facility with a gym-rat approach, wanting to win over coaches and veterans alike. His hell-on-wheels style should make Abram an immediate factor on special teams, and he has enough versatility in his defensive game to be a factor up in the box or back deep. One of the more fun evaluations in this year’s class, Abram will do whatever is asked of him on the next level. Is he best as a half-field ballhawk with elite processing traits and top-shelf athleticism? No. But Abram carries rare intangibles and will make himself into a factor on the next level. Teams raved about his interviews at the Senior Bowl and scouting combine, and he tested well enough there to ease concerns about his athleticism. Fun fact: Abram was dealing with an injury and could not perform on the field that week. That really upset Abram, who told Senior Bowl executive director Jim Nagy that he planned on staying all week to interview with teams and help assist any way he could with the South Team, coached by the 49ers. Abram earned himself some money with that gesture. Some injured players might get weighed in, stick around for a day or two and leave. 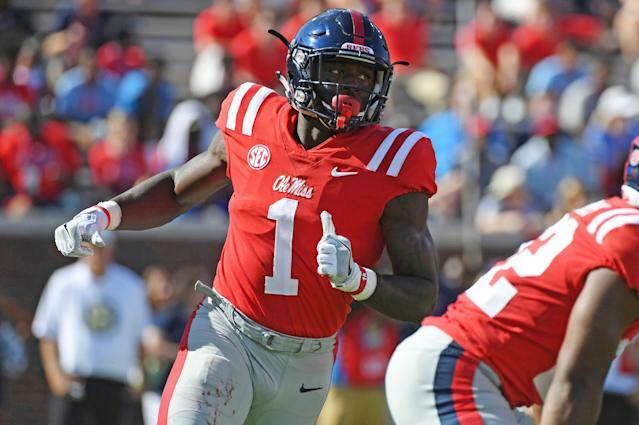 The lowdown: Brown was a highly touted high school recruit who made his impact felt as a freshman for the Rebels but really broke out in a huge sophomore season that saw him rank 10th in FBS with 1,252 receiving yards. He had been drafted the year prior by baseball’s San Diego Padres in the 19th round of the 2016 amateur draft as an outfielder and took part in extended spring practices each year since then. But Brown intends to give football a try first, and his production in the SEC – he put up even more yards (a school-record 1,320) in 2018 – gives you a good idea why. Built almost like a power back, Brown has been compared often to JuJu Smith-Schuster for their similar dimensions and playing styles. With a highly competitive spirit and a physical edge to his game, Brown has a clear path for success. But he also flashes underrated quickness, runs crisp routes and displays very good hands and concentration. He plays with a ball-is-mine mentality and also will make his presence known and felt as a blocker. One evaluator said Brown’s combine positional work was “by far” the best of any receiver in Indianapolis. Adapting to a more sophisticated offense could retard Brown’s growth slightly. He was asked to run such a limited route tree – mostly slants and in cuts – and work primarily out of the slot, which limits his appeal a bit. You rarely see him being asked to win battles downfield, although when he does he flashes his quality tracking ability (perhaps from his background as an outfielder) and that competitive desire to come down with the ball. Brown fits the role of the “big slot” receiver position that has been gaining traction around the NFL. Quick corners could give him trouble, but we see Brown as a pretty high-floor prospect who can add a little toughness to an offense. Fun fact: A four-star recruit out of Starkville, Mississippi, Brown was surprised how little the hometown Mississippi State staff paid attention to him despite winning a state title. Yes, the Bulldogs were the first team to offer Brown, but other schools paid him more attention and he ended up committing to Ole Miss, MSU’s hated rival. This did not go over well on social media, as fans threatened Brown – even with death threats – over his decision. Still, Brown honored his commitment and even stuck with the school when recruiting sanctions were brought down on the Rebels. The lowdown: Expected to test very well at the NFL scouting combine, Polite was a major letdown with a disappointing 40 time (4.84 seconds) plus a poor vertical jump (32 inches) despite his less than ideal size. He also cut short his workouts with a purported hamstring injury, one that NFL teams challenged him on, after things started to go south. A suspect combine session with the media was one thing; poor interviews with multiple NFL teams we spoke to was quite another. This appeared to turn Polite from a first-round certainty to an unknown commodity amid a crowded edge-rush crop in 2019. On the field, his elite edge-bending skills are quite visible as a sub-package end. He was one of only two FBS players to register 10 or more sacks (11) and five or more forced fumbles (six) this past season, and Polite was given second-team all-SEC mention despite starting only five of the Gators’ 13 games and not being used a lot on early downs. The reason for that is Polite’s inconsistent run defense. He’s played heavier in the past, closer to 270 pounds, but some scouts felt that wasn’t necessarily good weight (Polite admits he has had a sweet tooth in the past), so he could be a candidate for an offseason regimen overseen by the NFL team that drafts him. But Polite’s biggest issues vs. the run come with his lack of power and inconsistent technique to shed blocks and set the edge. If Polite can show maturity and accountability, he could be a steal. He possesses elite burst off the snap, rare bend and balance and strong finishing ability, and he could factor in on both odd and even defensive fronts. There’s plenty of tape displaying Polite’s energy and ability to disrupt in the passing game, and that always will be valued in the NFL. But so are complete players, which Polite is not yet. A boom-or-bust prospect with desirable traits but serious potential pitfalls in his overall makeup, Polite turns 21 at the end of March and might require strong leadership and consistent mentorship early on to coax out his potential. Fun fact: When Polite created a Twitter account as a freshman in high school, he thought about what his handle should be – and typed the words of the dream he said he wanted most. That’s how Polite came up with @RetireMoms. It was his goal to help his mother not have to work anymore, often putting in long hours as a housekeeper and a hairdresser to support their family and often working out of the family home to style other people’s hair. Polite promised her when he signed an NFL contract that she could quit her housekeeping job, that he would buy her a proper salon to work out of and – eventually – allow her to retire. The lowdown: Harry was a big-time recruit for the Sun Devils, and he bore immediate fruit in a big freshman season, leading all first-year receivers in FBS with 58 catches. He earned all-conference mention as a sophomore in leading the Pac-12 in receiving yards (1,142) and catching eight TDs, and Harry followed that up with a 73-1,088-8 receiving season as a junior. 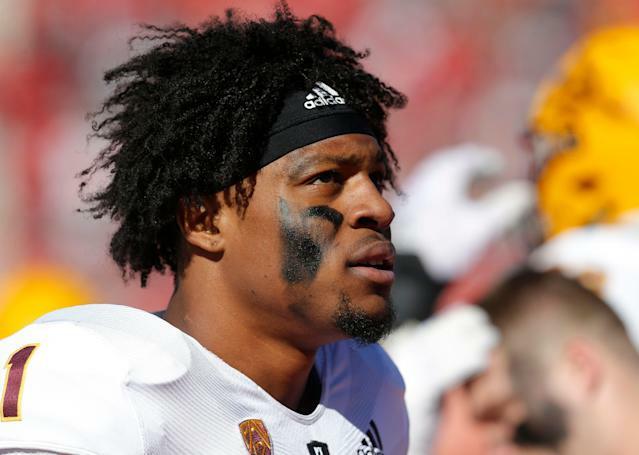 He declared early for the 2019 NFL draft and skipped Arizona State’s bowl game to prepare. Harry is a big, physical receiver who often lined up outside in the Sun Devils’ passing game his first two seasons, but he could project inside to a “big slot” role in the NFL, something the coaching staff allowed him to do more of in 2018. He’s fearless going over the middle and plays with a great combination of power and finesse in his game to win contested-catch situations and on slants, fades and back-shoulder throws. Harry’s lack of great speed and separation ability are hindrances, but he plays to his strengths well and will use his body to shield defenders away from the ball and make up for what he lacks. Another impressive element of his game is his work as a run blocker, which features the commitment needed to be effective in his department and good technique to extend his 33-inch arms for maximum effectiveness. He’s a highly competitive, driven young man with explosive lower-body power and just enough burst to project him as a strong WR2 and possibly a WR1 in time. Racking up numbers against suspect Pac-12 defenses has some people skeptical, his lack of suddenness can be compensated by the rest of his strong makeup as a player. Fun fact: Harry was born on the island of Saint Vincent in the Caribbean, moving to Arizona with his grandmother when he was 5, leaving his mother and sister behind. Harry returned to the island for the first time since leaving to visit his family in December 2017, which became a huge story while he was in the middle of his brilliant college career. It was in Arizona where Harry found sports as an activity and fell in love with playing football. It’s perhaps a surprise he didn’t pick up basketball as his main sport considering Harry’s uncle is former NBA point guard Mike Bibby. 33. Alabama TE Irv Smith Jr. The lowdown: Bama has had elite recruits all over the depth chart the past few seasons, yet Smith carved out a role on offense the past two seasons for the 2017 national champs and the 2018 runners-up. Despite catching a total of only 58 passes in those two seasons, 10 of them went for touchdowns and he averaged a whopping 16.1 yards per grab this past season in earning second-team all-SEC honors as a junior before declaring for the draft. Smith displays two-way ability as a receiver and blocker, although his work in the latter department might never be his strength. Still, he showed the requisite effort in this department and has blocked from a number of positions on the field: as an in-line tight end, a fullback, a wingback and as a “ghost” tight end. Other than needing technique improvements, Smith’s biggest shortcoming here is his size, which is considered small by NFL standards at the position, with a short, light frame and smaller arm length and hand size. There’s plenty to like about his receiving potential. We’re not talking about an O.J. Howard-caliber athlete here, but Smith displays nice, effortless speed and fluidity and he runs a more complete route tree than other tight ends in this class were asked to do in college. He’s still raw and his snap-to-snap consistency needs improvement, and making plays downfield won’t happen as readily in college. His testing numbers at the combine were considered a disappointment outside of a good 40-yard dash time (4.63); he landed on the lower end of the spectrum in the 3-cone drill and vertical and broad jumps. Smith, who turns 21 in August, likelyhashis best football in front of him. He’s a moldable talent who could end up as this class’ TE1 if his progression continues over the next few years the way it did the past two seasons for the Crimson Tide. Fun fact: Smith’s father, Irv Smith Sr., was also a tight end. He was a first-round selection of the New Orleans Saints back in 1993, playing 95 career games (76 starts) for the Saints, 49ers and Browns over seven seasons. The lowdown: Lindstrom was an almost immediate contributor as a freshman (nine starts at right guard), and he started for the remainder of his four-year career for the Eagles. Earning all-ACC honors as a junior, Lindstrom was forced to kick out to right tackle (11 starts) while also starting a pair of games at his familiar right guard spot. He’s the best pass-blocking natural guard in the entire class. 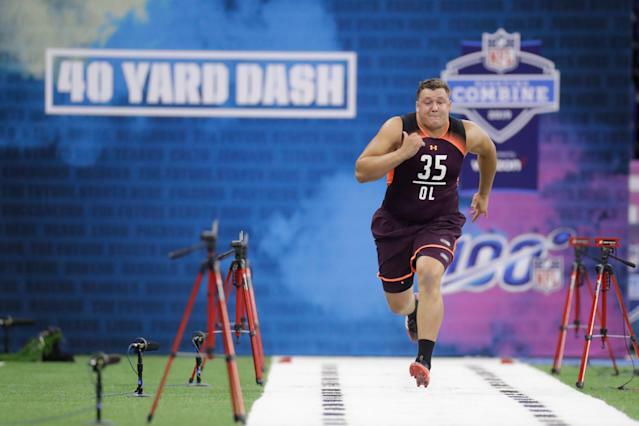 Other college tackles might kick inside and prove to be better at that task down the road, but right now Lindstrom’s technique and athleticism are head and shoulders over anyone who projects inside. That athleticism was on display at the combine, both in the athletic testing and the positional drills, where he earned high marks for his work. 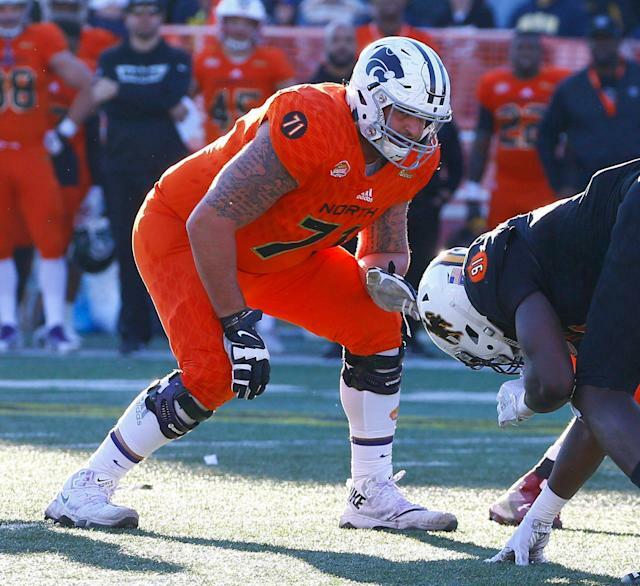 Lindstrom also looked like the most polished blocker at the Senior Bowl, where he seldom lost battles in one-on-ones, which is rare for the interior blockers who have it tougher in those drills. Able to climb to the second level and adjust his blocking angles on the fly, Lindstrom profiles to be a Day 1 starting guard (or center) in just about any type of blocking scheme, although he might fit best in a zone-blocking attack and likely won’t be quite as appealing to clubs that place a higher emphasis on mass and raw power at the position. Even with good arm length (34 inches), especially for an interior blocker, Lindstrom’s size is only average. He had to bulk up from 235 pounds in high school and is just starting to mature physically. He might need an additional year in an NFL weight program before he can approach reaching his maximum athletic potential. Still, with the toughness and great feet sought in a blocker, Lindstrom is a very safe pick who could start for a decade in the NFL and reach Pro Bowl status. Fun fact: You could make the claim that other than the Fluties, the Lindstroms might be BC’s first family. Chris Lindstrom Sr. is in the athletic department’s Hall of Fame as a lineman on the football team, even spending three years in the NFL with four different teams. One of Chris’ uncle, Dave Lindstrom, was a defensive end for the Chiefs for eight seasons. Another uncle, Eric Lindstrom, also played football for the Eagles, and Chris’ younger brother, Alec, was his teammate and fellow offensive lineman. The lowdown: “Hollywood” Brown is a slender, blurry speed demon whose game has been compared aptly to DeSean Jackson’s. Even though Brown wasn’t able to run a 40-yard dash at the scouting combine following surgery to fix a Lisfranc (foot) injury, speed never has been a question for him. (He clocked a 4.33 at Oklahoma’s junior day last spring.) The injury is expected to keep him out for part of the offseason, but reports have suggested that Brown should be able to report to a training camp ready to go. When he steps on the field – and once he’s fully recovered – there’s a better chance than not that he’ll be the fastest player on that field. Oklahoma displayed all the ways in which Brown can beat a defense, and he did so to the tune of 57 catches for 1,095 yards and seven touchdowns (19.2-yard average) with Baker Mayfield his quarterback in 2017 and 75 receptions for 1,318 yards (17.6-yard average) and 10 touchdowns in 2018 with Kyler Murray throwing him passes. Brown had a monster game in the College Football Playoff semifinal in 2017 (8-114-1 receiving) against Georgia last year, but Brown was held without a catch in Oklahoma’s playoff loss to Alabama in 2018, having suffered the foot injury previously in the Big 12 championship game. With an incredibly thin frame – he was 130 pounds when he graduated high school and 144 when he showed up at OU – Brown might always be susceptible to wear and tear more than other players with more body armor. But he has game-breaking ability with his speed and can take the top off of a defense at a moment’s notice. His ability after the catch is impressive, and he shows some nice competitiveness in his game that belies his size, even if he’s not at all a 50-50 receiver and can be brought down with arm tackles at times. Brown being on the field will be a problem for defenses, and the offense that adds him to the mix changes complexions immediately. But the questions about his limited role and long-term durability with a frame that might max out at 180 pounds will always be limiting factors. Fun fact: When Brown qualified late academically out of high school, he played at College of the Canyons (Calif.), but off the field it was a tough time. He had to work multiple jobs while trying to improve his grades and qualify to play at a school such as Oklahoma. One of those jobs included working at a Six Flags as a ride operator, and Brown had to walk to and from the amusement park every day. Brown grew up in Florida, and the nickname comes from his hometown there of Hollywood, and it’s fitting because of his electric style on the field. He’s also the cousin of Oakland Raiders wide receiver Antonio Brown. Draft range: Top-40 pick with a good chance to land in Round 1 if medical tests return positive.